Raised toilet seats with arms are useful assistive devices that can make life easier for seniors and those with limited mobility. They provide extra support that makes using the toilet less trouble whether or not you need the assistance of a caregiver. They are simple to install with no extra tools needed. We’ve selected several models that are all comfortable and affordable. Continue reading to learn more about these helpful mobility aids. The seat is well-made with a secure fit that stays in place. 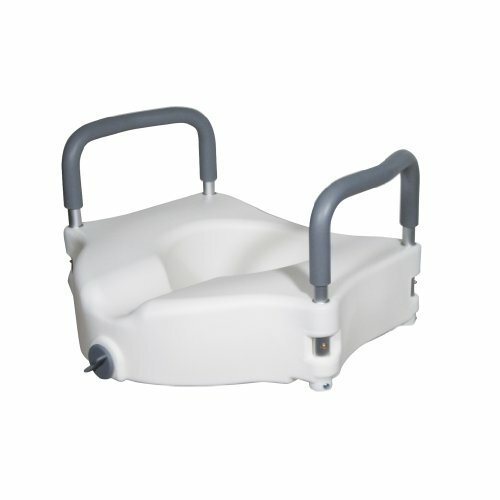 The Drive Medical Elevated Raised Toilet Seat offers an affordable solution that is easy to install on most toilets. It is lightweight and portable so that you can use it when traveling. The central part provides an extra 5 inches with an additional 5 inches when including the padded arm supports. The inside width is 18 inches, which is large enough for most seniors to use without assistance. From a caregiver’s perspective, it is easy to remove and clean. It locks securely in place to allow the individual to feel safe using it too. The 300lb. weight capacity is sturdy enough to support most seniors. The arms are removable, which is convenient for seniors short on space in their bathroom. Like many assistive devices sold by this manufacturer, you have a short window to decide if it works for you with fees if you choose to return it. The chair is easy to install with the ability to adjust the height. 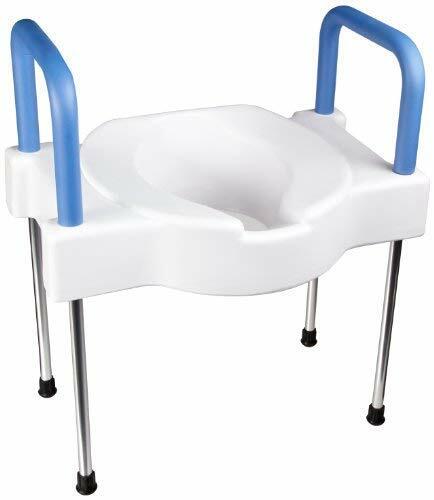 The Maddak SP Ableware Tall-Ette Elevated Toilet Seat is more like a commode than anything else. It attaches to the existing fixture to provide a secure, sturdy fit. The seat is 4 inches high and 18 inches wide inside the padded arms to protect seniors suffering from painful arthritic joints. You can also adjust the height. 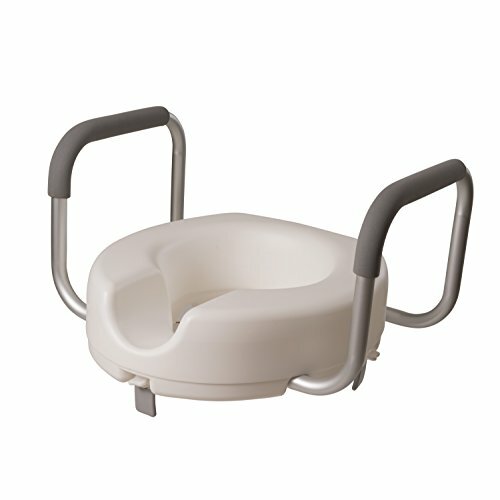 It works with both round and elongated toilets as long as it is under 18 inches which is enough for ADA toilets. Maddack offers their elevated toilet seat both with and without legs. The aluminum frame which we’ve also reviewed has a weight capacity of 400 pounds, making it a bariatric option. The stainless-steel version can comfortably accommodate seniors of all weights and the manufacturer backs up the product with a warranty to protect your purchase. It is an excellent choice if you’re looking for a more permanent solution. The chair is an affordable solution for standard size toilets only. Easily and safely attaches to your toilet bowl with 3 hand tightening clamps. Fits most standard round toilets. The DMI Elevated Raised Locking Toilet Seat provides 5 inches of extra height with handlebars that are padded for extra comfort and safety. It attaches to the fixture with three clamps. The frame is aluminum which provides strength and keeps it at a manageable weight so seniors and caregivers can store and transport with ease. This seat replaces the existing one, which could pose a slight issue if others are also using the same unit. The product is one of the more affordable raised toilet seats with arms we reviewed. The plastic portion is easy to clean in the rust-resistant frame. We also liked the design with the handles flaring out slightly. We felt that it made it easier to use and get on and off of it with minimal strain and without assistance. While simple in its concept, many seniors find them a godsend. They allow you to distribute your weight between your upper and lower body for better control. As you age, you being to lose muscle mass which can affect your ability to perform everyday tasks. These products help you overcome this challenge in an effective way by recruiting additional muscle groups. They provide the extra support and security you need whether it’s a temporary addition or a permanent fixture in your home to prevent the increase in falls that accompanies the decline in mobility and function as you age. Some products are replacements for the existing toilet seat. Others are removable so that others can use the bathroom too. We prefer models that can attach without using other tools. The main concern is security. It needs to fit well without the risk of falls for optimal safety since falling once increases your chances of a recurrence and possible injury. Removal is another essential consideration, especially if you or your loved one are the only individuals who need this product. We urge you or your caregiver to check the fit frequently to ensure its safe use no matter which model you choose. You’ll also find portable ones that you can take when traveling which adds to their value. These specifications will likely decide how well an item will work for you. Most products we researched had a seat height of 4 to 5 inches which was adequate for the average size person. Also, consider the measurements of the arms or handles if present. They can give you another 5 inches or so to make getting down and up easier along with the extra support. You’ll see raised toilet seats with arms with or without legs that make them a standalone unit. The advantage of the former is that they often give you the ability to adjust the overall height of the device. It can easily make a product usable where it won’t be without this addition. It adds to the flexibility and versatility for a variety of individual situations and mobility issues. Also, find out the dimensions of the seat, especially the inside width. Most fall between 17 and 18 inches, although you’ll also find narrower and wider ones available too. A lot depends on the toilet they fit. The manufacturers specify whether it will work with standard or elongated fixtures. If you notice a height limit, we recommend measuring your existing one to play it safe if it is an ADA model. Many products have a molded plastic seat which makes them less expensive while providing an item that is easy to clean. The contoured design adds to the comfort too. You’ll often see them with a metal frame that provides additional support and security. Aluminum offers strength without the extra weight. You can use them without assistance which makes them a smart choice if you live alone. You may also find models made of stainless steel. That can make them more cumbersome to use while still providing extra durability. However, they are a smart option if you need a permanent solution for an assistive device to support your independent living. We prefer products with padded or cushioned arms to protect our hands when using them. If you have arthritis, you may find that it is a must-have feature. Over 22 percent of Americans have this condition, making this feature a welcome addition for many people. We suggest that you look for models with waterproof materials to make cleaning quicker and to create a more sanitary environment. Seniors are more likely to get sick, often with longer recovery times too. Anything you can do to reduce your risk is essential, making it another vital feature. We urge you to read the product descriptions carefully, especially concerning dimensions. Some manufacturers may not accept returns on them. Others may charge you for return shipping or a restocking fee. That’s one reason why we also suggest you stick with items that have a satisfaction guarantee or warranty. Most toilet seats run under $100. Ones without legs are less expensive. Our advice is to put your safety and comfort first with this purchase. If you’re uncertain, limit your search to those with adjustable heights. They may cost a bit more, but you may find that it’s worth the expense in the end to get the product that will provide the best support for you. Raised toilet seats with arms provide a useful solution for individuals who need extra support to counter muscle loss or reduced mobility due to health issues. They optimize the way your body performs everyday tasks to make your life safer while enjoying the ability to age in place in your home safely.